Panasonic has unveiled its latest addition to the Lumix G Micro System line-up, with the Lumix DMC-GF1 claiming to be the world's smallest and lightest system camera with built in flash. The rather snazzy looking Panasonic Lumix DMC-GF1 is not only capable of capturing stills, but also video – including 1280 x 720 AVCHD Lite movies and at 60fps. An exposure meter and shutter speed preview is visible in live view and, for those that find black a bit 20th century, you can also get the camera in 'active red' and 'sleek silver'. Apparently the Lumix DMC-GF1 does not contain the pentaprism usual to cameras with interchangeable lenses and the mirror-less structure is responsible for the savings on size. 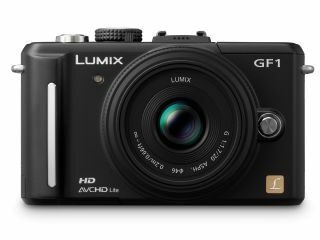 "The GF1 comes equipped with a built-in flash and boasts a large, 3.0-inch Intelligent LCD with a wide viewing angle and full 460,000-dot resolution, says Panasonic. "Panasonic has succeeded in raising the level of image quality for all LUMIX G Micro System cameras to rival or even surpass that of D-SLR cameras. "The 4/3-type 12.1-megapixel Live MOS sensor in the GF1 offers the best of both worlds - the superior image quality of a CCD sensor, and the lower power consumption of a CMOS sensor."